2016 ARCHIVE: Visit the IMMERSIVE ITALY site for current events.
.:: This Event is Over. Visit the IMMERSIVE ITALY site for current events. ::. 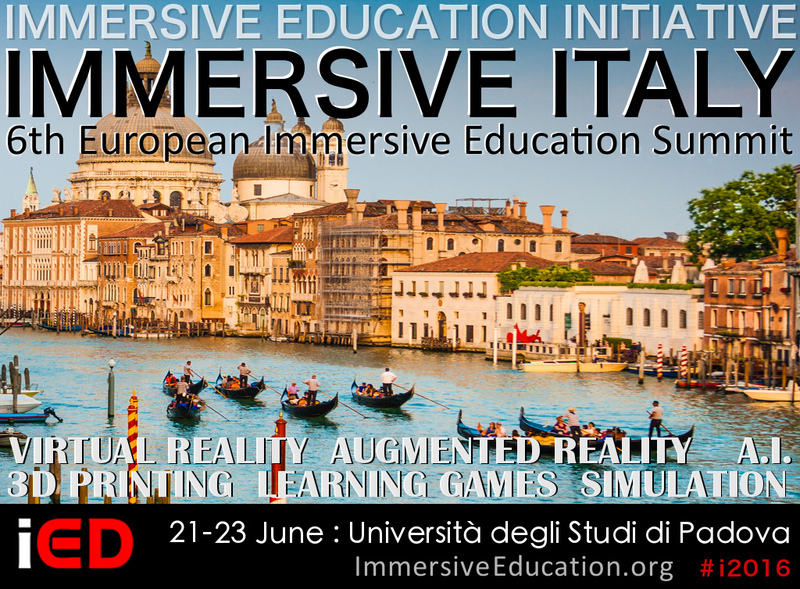 DAY 1 (June 21): IMMERSIVE ITALY and EiED 2016 open in the afternoon at Università degli Studi di Padova (University of Padua) with a opening series of talks, presentations and the instructional portion of the "VR in Venice" hands-on Virtual Reality workshop. Afterwards we will travel together (as a group) to Venice by train where we will create our own VR scenes on the canals of Venice (putting into practice the VR skills taught in the workshop). After the gondola rides we will socialize over dinner in Venice, and then travel back to Padova (Padua) together. DAY 2 and DAY 3 (June 22 and June 23): The remainder of the conference occurs in the San Gaetano, the cultural center of Padova, which is a short 7 to 10 minute walk from the university. Plan your visit: View on Google Maps. Please note that hotel rates typically increase as the date to the event approaches. Book your hotel as far in advance as possible for the best rates. There is no official hotel, allowing attendees to select accomodations that best fit their personal intersets and budget. A list of hotels and accomodations is available in PDF format below. Hotel Discount: In order to receive the special conference rates (prices) that appear on the list below you must inform your hotel that you that you are attending the Immersive Italy conference at the Università degli Studi di Padova (the University of Padua). Short-term rentals: Depending on how long you plan visit there are a number of short-term rentals that often cost less than hotels. Both http://airbnb.com and http://vrbo.com offer short-term rentals. The Immersive Education Initiative is a non-profit international collaboration of educational institutions, research institutes, museums, consortia and companies. The Initiative was established in 2005 with the mission to define and develop standards, best practices, technology platforms, training and education programs, and communities of support for virtual worlds, Virtual Reality, augmented and mixed reality, simulations, game-based learning and training systems, immersive teaching and immersive learning systems, and fully immersive environments such as caves and domes. Speakers at iED Summits have included faculty, researchers, staff, administrators and professionals from Boston College, Harvard University (Harvard Graduate School of Education, Berkman Center for Internet and Society at Harvard Law School, and Harvard Kennedy School of Government), Massachusetts Institute of Technology (MIT), MIT Media Lab, The Smithsonian Institution, United Nations Educational, Scientific and Cultural Organization (UNESCO), Federation of American Scientists (FAS), United States Department of Education, National Aeronautics and Space Administration (NASA), United States Department of the Interior (DOI) National Park Service, Temple University, Rice University, Stanford University, Internet 2, Cornell University, Loyola Marymount University, Southeast Kansas Education Service Center, Kauffman Foundation, Amherst College, Boston Library Consortium, Walt Disney Animation Studios, Stratasys Ltd., Duke University, Oracle, Sun Microsystems, Turner Broadcasting, Open Wonderland Foundation, Gates Planetarium, Vertex Pharmaceuticals, University of Maryland College Park, UCLA, USC, Google, Microsoft, Intel, Halliburton Company, Oracle, Computerworld, The MOFET Institute (Israel), Technion Israel Institute of Technology (Israel), Keio University (Japan), Chukyo TV Broadcasting Company (Japan), Nikko Telecommunications Company (Japan), National University of Singapore (NUS), Open University (UK), University of Glasgow (UK), Coventry University (UK), University of St Andrews (UK), Giunti Labs (Italy) and European Learning Industry Group, University of Barcelona (Spain), Universidad Carlos III de Madrid (Spain), University of Oulu (Finland), Royal Institute of Technology (Sweden), École Nationale Supérieure des Arts Décoratifs (EnsAD; France), Interdisciplinary Center Herzliya (Israel), Graz University of Technology (Austria), University of West of Scotland (UK), University of Essex (UK), Universidad Complutense de Madrid (Spain), University of Vienna (Austria), Government of New South Wales (Australia), Eötvös Loránd Tudományegyetem (Hungary), Universidade Federal do Rio Grande do Sul (UFRGS; Brazil), Indian Institute of Technology, Delhi (India), and many more world-class organizations.